The Tower of London is not only the most important set of buildings in Britain, it's the most visited of the city's many tourist attractions. In its long history, this remarkable UNESCO World Heritage Site served as a stronghold (many times besieged, never taken) as well as a royal palace; a prison and place of execution; a royal mint and treasure vault; an observatory; and for five centuries, a private zoo. Built by William the Conqueror to protect London and to keep an eye on the city's citizens, as well as boat traffic on the River Thames, the original Tower - the White Tower - was built about 1078. 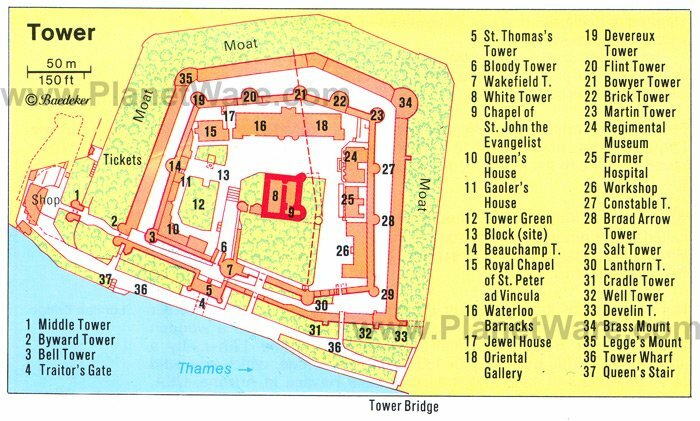 Covering some 18 acres, the tower complex today consists of the Outer Ward, surrounded by a wall with six towers and two bastions, and the Inner Ward, with its 13 towers. The tower was long a place of confinement, among its many prisoners King David II of Scotland, Princess Elizabeth (later Queen Elizabeth I), Sir Walter Raleigh, and William Penn. Many famous people were also executed or murdered within its walls, including Henry VI, as well as two of Henry VIII's wives. The last executions carried out in the tower took place during WWII, when a number of spies were shot here. It's no wonder that ghosts are reputed to haunt its ramparts and dungeons! In the center of the Inner Ward, the White Tower - named for the white stone it was built from - was begun in 1078 and completed about 1100. Four stories tall, with walls up to 15 feet thick, the structure has small cupolas on the corner turrets. These were added in the 17th century, and the exterior was later restored by Christopher Wren. A highlight is Line of Kings, with its remarkable displays of royal armor. Acknowledged as the world's oldest tourist attraction - it was established in 1652 - this collection of weaponry includes hunting and sporting weapons from medieval times to the end of the 19th century, arms and armor used in tournaments, as well as some that belonged to Henry VIII. Look inside St. John's Chapel, a well-preserved example of Norman church architecture dating from 1080. The Jewel House has been home to the Crown Jewels since 1968. This unique collection includes St. Edward's Crown, made of pure gold and still used in the crowning of British sovereigns, as well as the Imperial State Crown set with more than 2,800 diamonds and other precious stones. Made for the coronation of Queen Victoria in 1837, it's worn at the state opening of parliament and on other special occasions. Other interesting items include the Golden Anointing Bowl and Spoon, the only relics of the original regalia to survive the Civil War. The Royal Mint - located here from 1279 to 1812 - is the focus of the excellent Coins and Kings exhibit. Portraying the lives of the workers and the stories behind the coins they minted, the exhibit is on the site of the original mint and includes interactive displays and rare objects from the Royal Mint Museum. With its re-creations of the quarters used by England's kings and queens during their frequent visits, the Medieval Palace was constructed by Henry III and his son Edward I while expanding the tower's defenses, and is famous for its opulence. Prime examples include the remarkable St. Thomas's Tower Fireplace, Edward I's Bedchamber, the Chantry, and the Lanthorn Tower with its collection of rare objects dating back to the 13th century. It was in the aptly named Bloody Tower that many of the darkest of the tower's secrets were kept - and some of the country's dirtiest deeds done. Among its famous prisoners was Sir Walter Raleigh, whose cell remains as it was during his three imprisonments here (including one 13-year stretch). The tower received its name after the "Princes in the Tower," Edward and Richard, were murdered by their uncle King Richard III. One of the finest looking of the site's many towers, Middle Tower was built in the reign of Edward I (1307). It was once accessible only by two drawbridges. Above its main gate is an often-pictured stone carving of the royal coat of arms. Beyond Middle Tower stands Byward Tower, containing guard rooms and the machinery for the portcullis, which can still be seen in the upper rooms. In the Bell Tower, built by Richard I in 1190, you'll find Princess Elizabeth's Walk, the rampart leading to Beauchamp Tower on which the future Queen Elizabeth I strolled during her imprisonment here. The massive Wakefield Tower is where the famous ravens are kept. The Tower of London was also once famous for its Royal Menagerie, and a fascinating exhibition about these royal beasts is in the Brick Tower. The Chapel Royal of St. Peter ad Vincula takes its name from the day it was consecrated, the festival of St. Peter in Chains. Built around 1100, it was altered in the 13th century, rebuilt after a fire in 1512, and renovated and restored several times since. It's also notable as the place where many of those executed in the tower or on Tower Hill are buried. Sunday services include Holy Communion at 9:15am and Matins, which is sung at 11am. Many of the Tower of London's executions took place on Tower Green, now marked by a moving memorial on the site of the execution block where condemned prisoners were beheaded. Execution inside the tower, away from the crowds, was a privilege reserved for those of high rank or for those who had strong popular support. The best-known of those executed on or near the site are the three Queens of England: Anne Boleyn, second wife of Henry VIII; Catherine Howard, Henry's fifth wife; and Lady Jane Grey who was just 16. Anne Boleyn was executed by the clean stroke of an expert swordsman specially imported from France, while another victim, Margaret Pole, was less lucky - a blundering executioner hacked her head and shoulders to pieces. On one side of Tower Green sits Queen's House, an attractive half-timbered Tudor house in which Anne Boleyn spent her last days before execution. It was also where the trial of Guy Fawkes took place. With the full title of The Yeomen Warders of Her Majesty's Royal Palace and Fortress the Tower of London, and Members of the Sovereign's Body Guard of the Yeoman Guard Extraordinary, it's no wonder they are best known by their nickname, Beefeaters. Mostly ceremonial today, these Yeomen Warders, dressed in their distinctive uniforms, guard the tower and act as guides. They are all retired, senior non-commissioned officers who served with distinction. Among their duties is the ceremonial closing of the gates each evening. Known as the Ceremony of the Keys, this 700-year-old tradition sees the Chief Warder present the keys of the tower to the Resident Governor. Special passes are required to view the ceremony and must be obtained in advance in writing (a stamped addressed envelope is required, and include two dates you could attend). The ceremony begins nightly at 9:40pm. This excellent museum portrays the history of the famous Royal Regiment of Fusiliers, formed in 1685 by King James II from within the ranks of the Tower of London Garrison. The regiment's first Commanding Officer was given the title Constable of the Tower (a position that lives on to this day), with his men barracked in the Waterloo Block. The museum is housed in what were once the Officers' Quarters, a building that houses the Regimental Headquarters and Officers' Mess, and which is still used on ceremonial occasions. Highlights include a collection of 12 Victoria Crosses, King George V's uniform (he was former Colonel-in-Chief of the Regiment), and relics from the Napoleonic Wars. South Place Hotel: five-star luxury, warm hospitality, mood lighting, spacious bathrooms, Michelin-starred restaurant. Apex London Wall Hotel: 4-star hotel, welcome gifts, stylish decor, Elemis toiletries. Hotel Indigo London Tower Hill: mid-range pricing, four-poster beds, brick walls in guestrooms, complimentary mini-bars. hub by Premier Inn Spitalfields, Brick Lane: budget hotel, great-value, eco-friendly, crisp-white decor, complimentary tea and coffee. Tours and Tickets: Because this is the city's most popular attraction, ticket lines are inevitably long and slow. You can skip the line and get priority entrance with a Tower of London Entrance Ticket Including Crown Jewels and Beefeater Tour. The lively tours conducted daily (every 30 minutes) by the Tower's Yeoman Warders offer the scoop on everything from Henry VIII's wives to executions and ceremonies. The last tour is 2:30pm (winter), 3:30pm (summer), and they are included with the price of admission. Closures: Parts of the tower are often used for ceremonies and events, including the Chapel Royal of St. Peter ad Vincula. To ensure closures don't affect your visit, check here in advance of your trip. Timing: Allow at least three hours to see everything and try to avoid busy times such as school holidays, when line-ups can be long. Getting to the Tower of London: Bus routes 15, 42, 78, 100, and RV1, as well as the District and Circle lines of the Tube (Tower Hill Station) all serve Tower Hill. Riverboats for Tower Pier depart from Charing Cross, Greenwich, and Westminster; Thames Clippers' catamarans depart every 20 minutes from London Bridge Pier and Tower Pier.